Today sees us starting a new weekly theme which is "In the Garden" - so look out for some lovely takes on the title this week from our DT. Today also sees the last post from September's GDT - Ruth McQuinn - a big thank you to Ruth for joining us this month. Hi all. 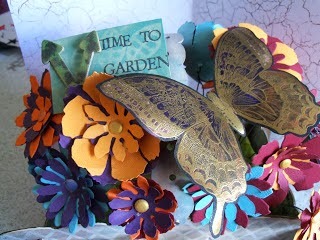 This week's challenge is 'In the garden'. In my head, I saw my Mum out in the garden cutting dahlias for the chapel flowers, with an old fashioned, and indeed OLD trug. 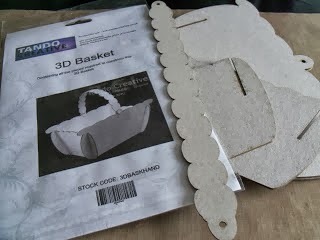 So I started off with the 3d basket, and set to, to make it look old! I ran all the pieces through the big shot with the Harlequin mask. Several layers of paint later, I used the harlequin mask again and some distress ink, to really knock it back. I forgot to take a final photo of the replacing of the mask, and the re-inking - but you will see it at the end. 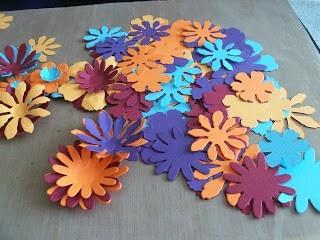 Then I die cut a few flowers. More than a few actually! 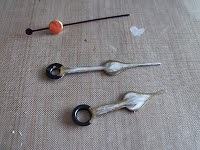 I layered them up and created stems out of florist's wire, and glued some card candy over the middle, to hide where the wire went in. All the flowers were planted into oasis, which I covered with tissue paper sprayed green. Doesn't oasis feel odd? Not sure I like it... 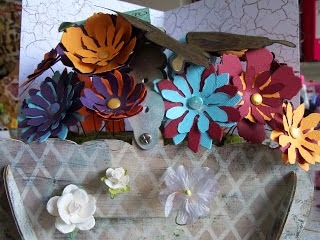 I had also Crop-o-dile'd a few holes through the side walls, and pressed some prima flowers through. 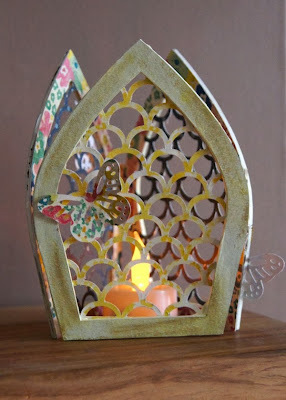 I stamped and embossed in gold a massive butterfly, and then painted it in Twinkling H2Os on the front. On the back, it got a coating of Alchemy paint, to give that shimmer you see when a butterfly closes its wings. The finishing touch was a small piece of board painted up, and then stencilled with the leaf mask, and then stamped with 'Time to Garden'. I had two spare clock hands from somewhere, painted up in the same sort of colours as the trug and the plaque. And now I have a reminder of my Mum's green fingers! Wish I had inherited them!! …and sort of from the top down! 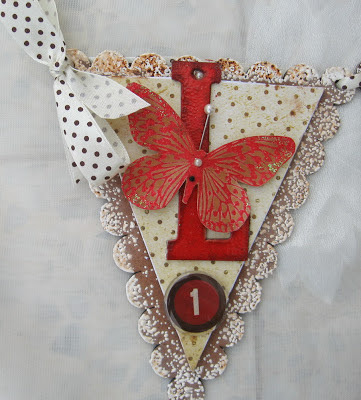 Don't forget to pop on over to Ruths blog for more of her lovely creations. another great project tomorrow - see you then. A large banner in Stampotique Originals ! I used some Tando chippies to do it and some of my favourite Stampotique stamps, starting from one plain A4 Chipboard Sheet. 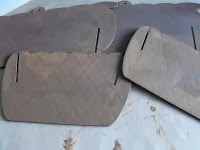 All the sheets are cut out in very sturdy 2250 micron greyboard, which supports many layers of paint or inks, and spritz of water over it too. I love these sheets !! 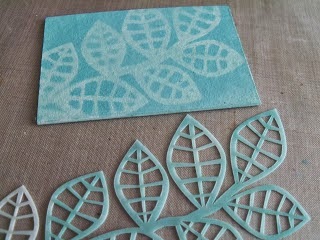 I used a largest size A4 (210mm x297mm) one and cut it in half so that I get the perfect size for a blog's banner. I will use the other half side for another future banner I think, or anything else ! I made the background playing with my Fresco Finish Paints, Grunge Paste, and three Tando's masks I really LOVE : Dotted Star, Sequin Waste and Burning Rubber. I put over it 5 dominos from the straight dominos bag (I've kept the five remaining ones for another project). 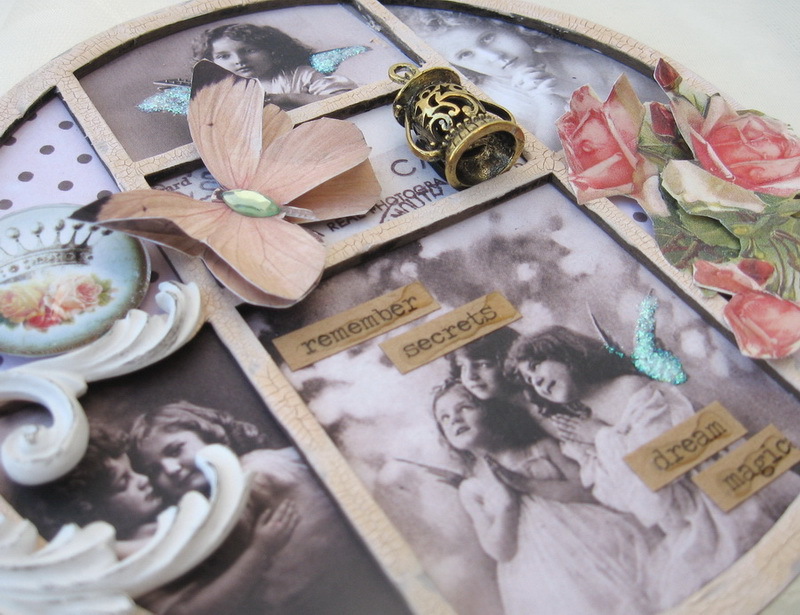 At first I stamped my dominos in Black Stazon to create a little scenery using a selection of Stampotique stamps (you can guess that I'm a big FAN of these rubber stamps !!! 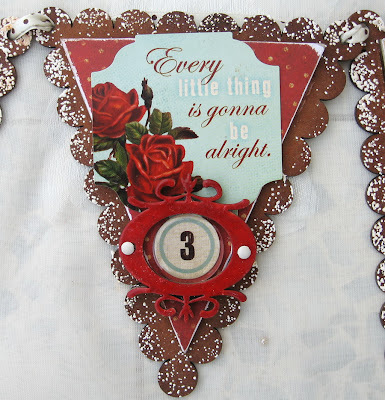 ), next I used my palette of various Distress inks to colour them. 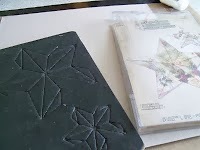 I also introduced a bit of Snowflake paint and used a white roll pen and fine black marker to highlight some areas. 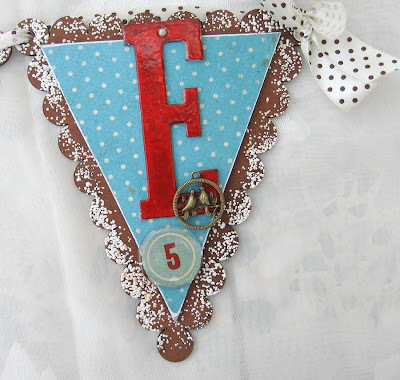 All the edges of both the dominos and the banner were heat embossed using a mix of powders (Metallic detail copper from Stampendous, and Cricket Zing from American Crafts). I also largely sprayed some satin varnish at the end on top of all the elements to protect the whole banner. Well, hope you like my funny banner as much as I do ! Irit is here again and this time with my Larger then Life project and actually it means to use Big Tando pieces and this banner is sure BIG! You know that Love is bigger the life and Tando Creative banners are sure Big: big fun to make and big pleasure to give as a present. 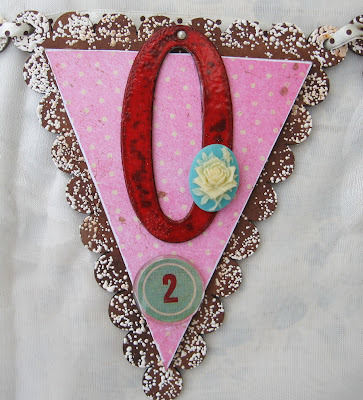 Each piece was inked and heat embossed around, then I glued dotted Bo Bunny papers over each single piece and added the very old heat embossed letters. I stamped one single butterfly for the first piece. 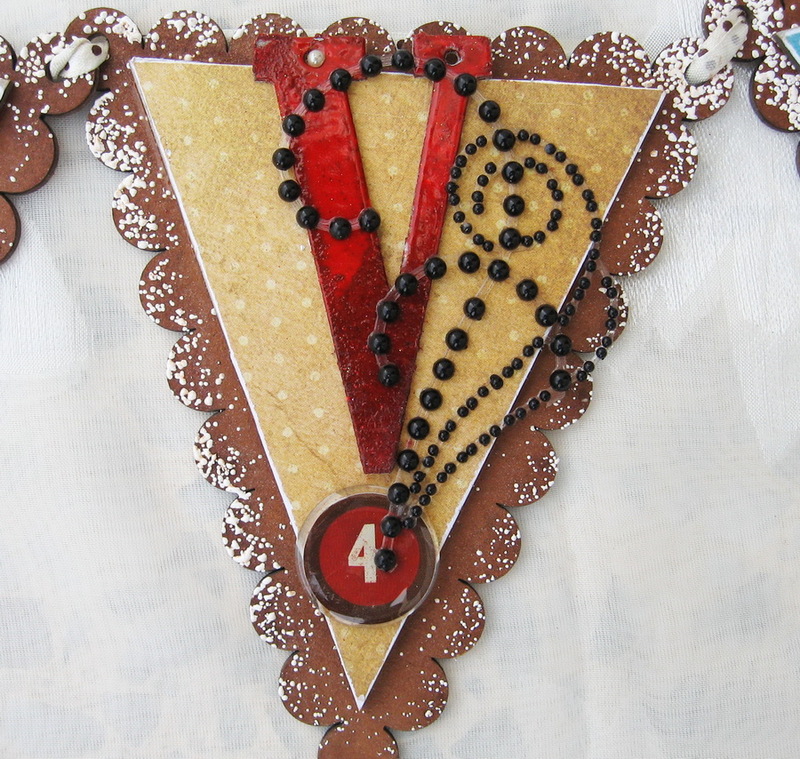 Added some embellishments over the other ones. This Tando book plate was a must over the central piece.Small book plate heat embossed in red on the middle. See you in a few days with more Tando inspiration! Here is Ruths take on this weeks theme of:- "Larger than Life"
" The only guidance for this week's challenge was bigger pieces rather than minis. 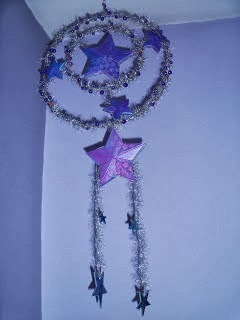 Well, this take on a dream catcher measures 30" from top to bottom! Biggest thing I have ever done! 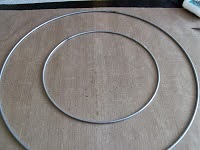 I started with 3 sheets of 12x12 Tando chipboard, and two metal rings, 12" and 7" diameter. 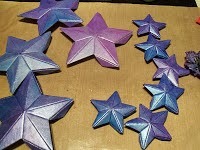 I used a couple of different star dies to cut the stars out of the card, and then painted them up to give them a good base coat. 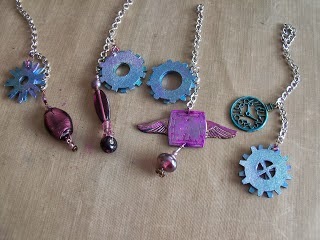 Then I blinged them up, with mica (what else?!) 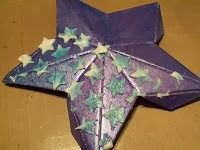 and when that was dry, I used a star mask, with translucent embossing paste. When that dries, it is amazing the effect it has on the paint and mica below. It pulls the mica up into itself, and holds it in suspension, almost. had this silver furry ribbon in my stash, along with the beaded wire. 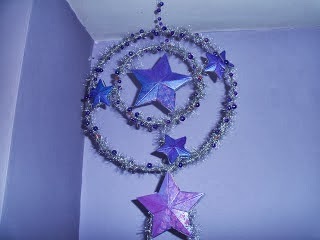 I glued the stars together, trapping the silver 'fur' in between the two layers, and then wound the excess round the rings. 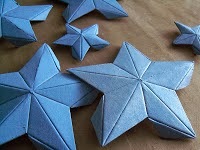 The smaller stars hanging from the bottom had the same treatment, but with slightly different colours. When dry, they were glued together, trapping the end of the tinsel in between. Ho hum, lilacs against a lilac wall! Not sure it is showing up THAT well. Don't forget to pay a visit to Ruth's blog to see more of her creations. 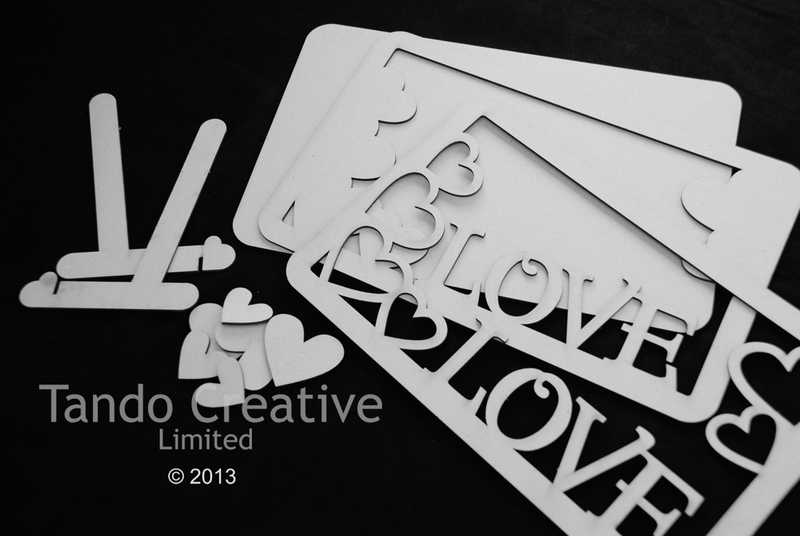 As you will all know this weeks challenge is to use some of Tando's larger pieces. 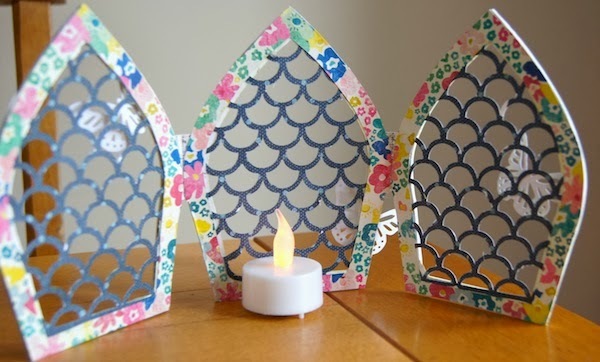 I used some more of the arches in my arch set - I find them so versatile - I've made little notice boards and frames....now a candle screen (and when I say candle I mean the battery operated ones and not the flame ones as flames and paper burn!). I used double sided papers for this project so you don't get a white side. I started by coating my arches in gesso and then misted them with yellow mist and added some gold gelato pastel colours too which I smudged in with my fingers. I cut our a scalloped shape with my die cut machine, and then carefully cut it slightly wider than the arches. 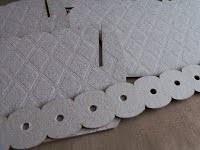 To hide the join I backed my arches with paper - this also covers up the small hinge that I made our of paper too. 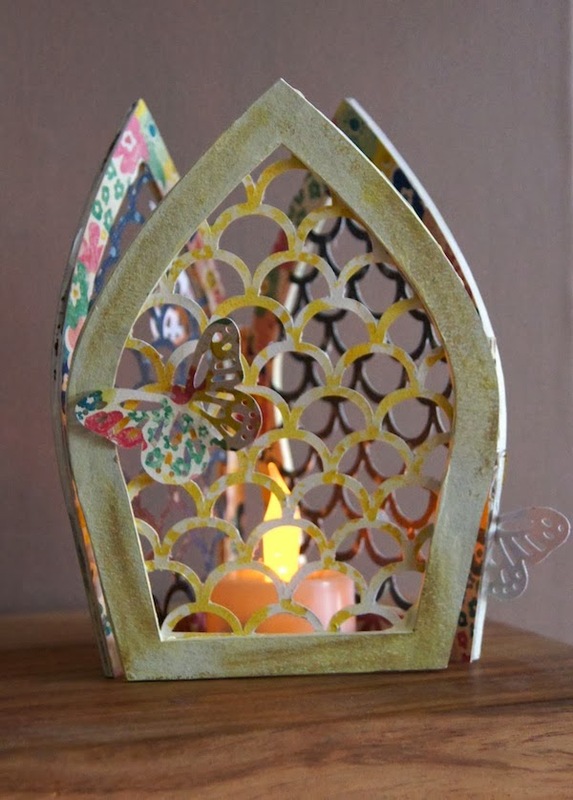 I then added a few butterflies and a battery candle. 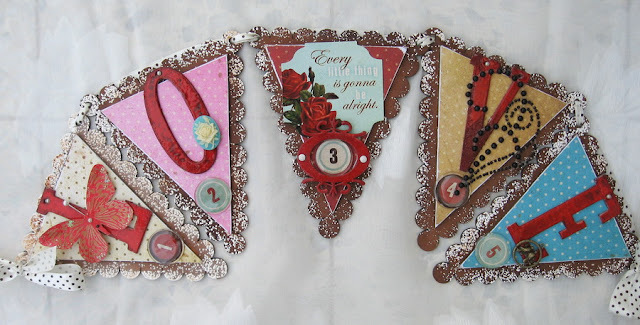 Its Wednesday and today we have two great projects over on the challenge blog - pop on over and take a look....see you there. A couple of weeks ago I went with my sister and her tiddlies to a little animal rescue place near us I took loads of pics and have used one for my project. I know its not my usual choice of colours but I went with what the children were wearing hahaha! Hi all! This week's topic was 'Free for all'. This made me think of 'free time' and I do love doing a clock! The first time I 'noticed' Tando was on an Andy Skinner workshop, where we did a box, with cogs and things, then the next time was a clock. I now have 3 Tando clocks around the house! 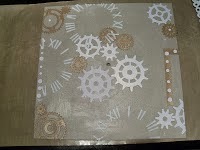 I started this time with a 12 x 12 sheet of board from Tando, and I pinched a mechanism out of one of my other clock kits, sat in the cupboard. I had a bag of Tando cogs, and several cog dies. 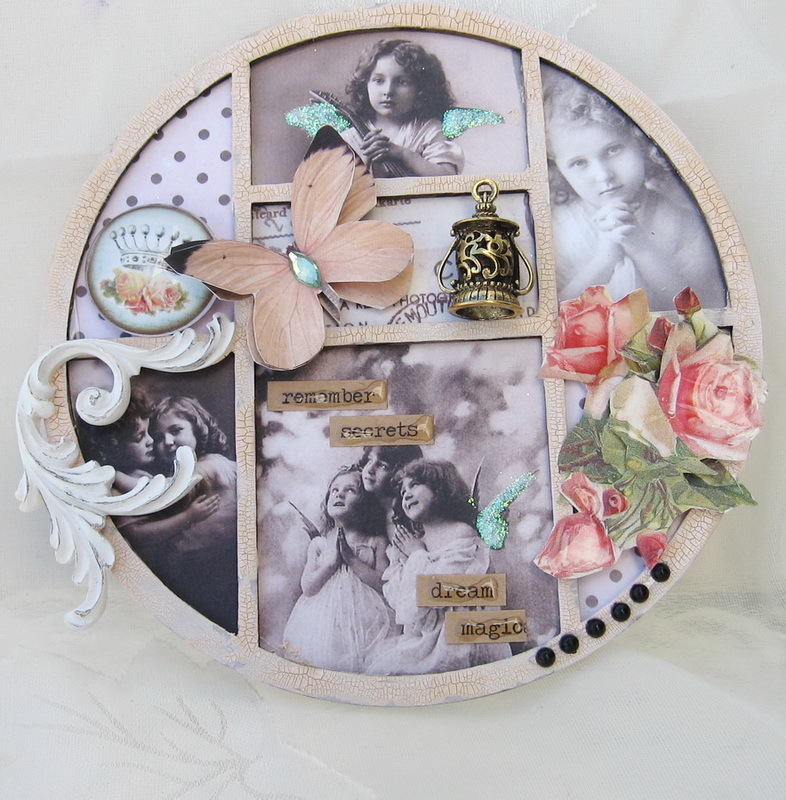 I also used the large circular clock face. I had in mind Andy's rust technique, but more blingy. 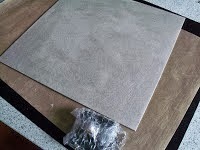 I sealed both sides of the board with matte medium, and punched a hole in the centre of the board with my crop-o-dile. 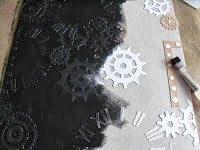 I cut several cogs and glued them down on the board, and some webby stuff from my stash, and used a clock face mask with modelling paste. I then painted the lot with lamp black, three coats, to give it a good base. When it was dry, I gave it two washes (allowing it to dry in between coats). Then I got my new Stewart Gill paints out! These are billed as jewel tones, and oh yes! They are. The colours mix really well, and there are also some amazing iridescent mixers too. 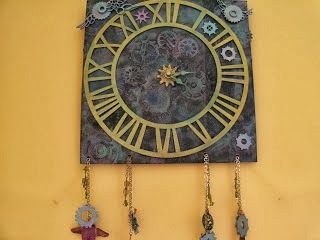 I painted the clock numbers in shades of green and gold; I was thinking verdigris, but heavy on the gold. 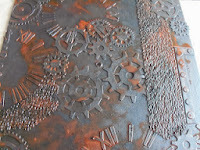 The Tando cogs I painted separately, that is, straight in with the jewel paints. The photographs really don't do it justice - the shimmer is amazing! 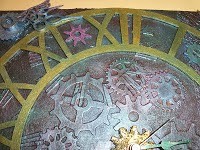 Then I came to assemble to the clock - and realised (again - I did exactly the same thing last time!) that the mechanism needs two layers of board, not just one! 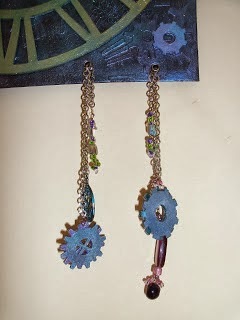 So, one of the spare circles I had over in my stash went through the big shot, to create another cog as the centre dial. 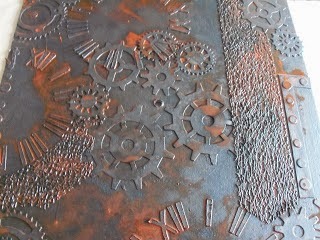 It got a similar treatment to the clock face, but with some embossing powder to give it a pitted look. The hands got alcohol inked, so they would stand out against the face - if I had left them black, I'd have never been able to read the time! This has definitely been the most involved piece I have done to date. Plenty of layers of paint, and then making all the bead drops for the weights! 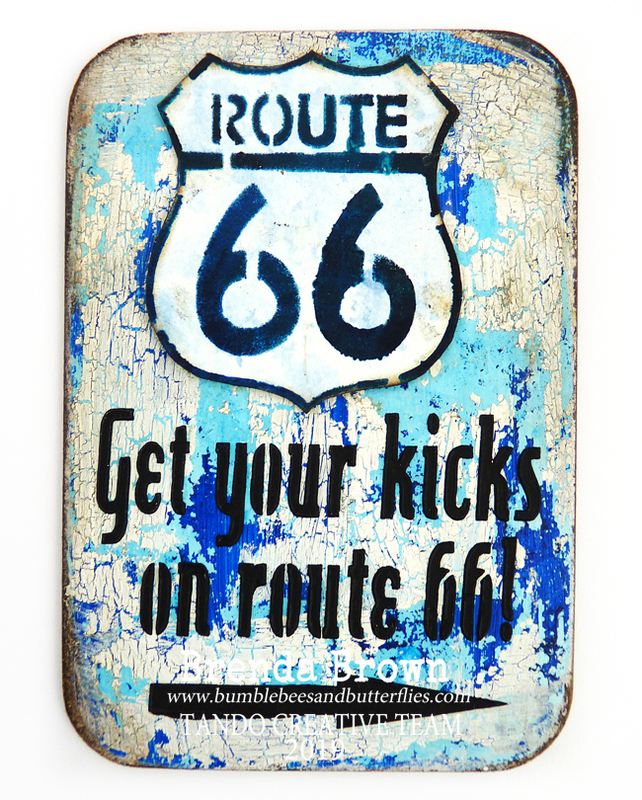 But, I am so pleased with it; I think it will go in my bedroom! 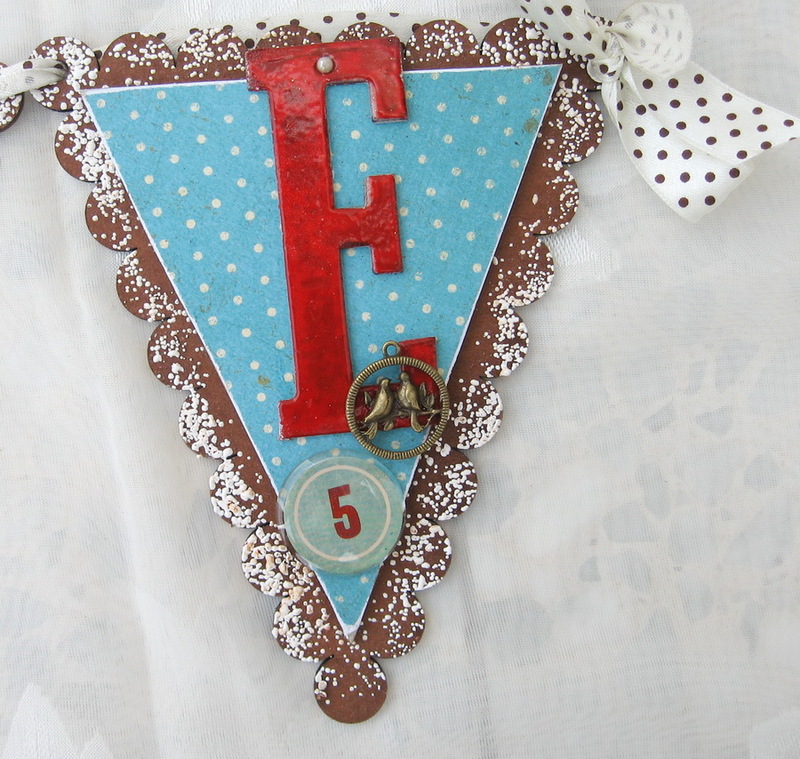 What a fab piece Ruth - don't forget to pop on over to Ruth's blog to see more of her lovely creations. Irit is here and it was quite a long time since I altered our gorgeous Tando Printers trays. 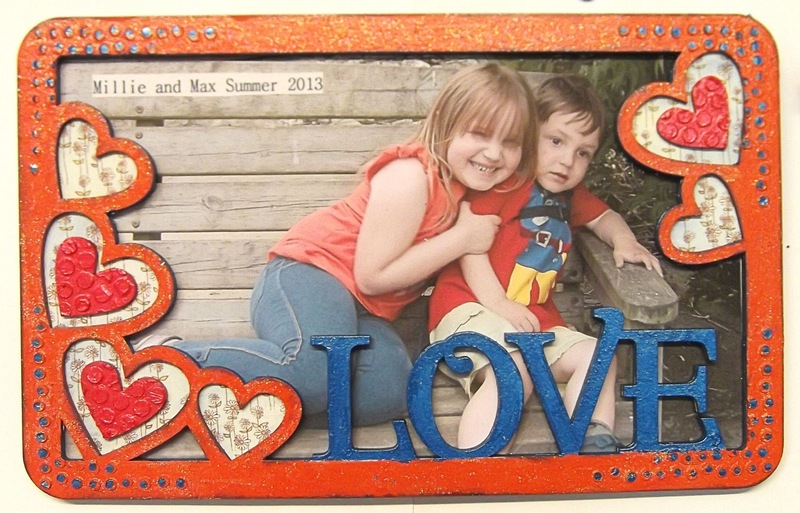 So here is one round- made with Inkido products and some Ranger crackled paint over the frame. Very easy to make project: just use Inkido papers and Tim Holtz stickers and that's all you need to make this vintage beauty! A BIG AND GREAT FAMILY ! !